The martial arts, traditionally, is a very physical pursuit. Truly a labor of love, training in the martial arts taxes the human body like few things can. Energy (ki) flows most efficiently through an open channel, much like water flows through an unobstructed garden hose. Any impediment will not only block the delivery of energy, but will actually create a much greater demand for energy than is actually needed for the task. In other words, the ability to relax creates a state which utilizes martial arts techniques with premium efficiency. Speed and power are born of the relaxed state. Relaxation starts in the mind. Anxiety, rage and doubt - all fear based behaviors - are analogous to bending a garden hose that is supplying the water. Most negative psychological states create unconscious muscular contractions which interfere with proper execution of technique. Throughout the move, stay loose and relaxed; only at the end of the strike or block should the muscles contract - then immediately relax again. This describes the concept of snap. Snapping techniques actually involve staying loose through about 99% of the move. While being in shape is a natural by-product of dedicated training, the inability to relax will definitely produce rapid fatigue. A performance of kata by a master practitioner clearly illustrates how important it is to loosen up in certain sections, then explode into a fusillade of punches and kicks in others. The "breaks" in the kata are very important; otherwise it would be one frantic volley of offensive tactics that would leave the practitioner exhausted. Proper breathing - which has been proven to produce a calming effect on the central nervous system, is yet another factor to consider. The ability to relax conserves energy, allows clear-minded awareness, and prepares the practitioner to strike with devastating power. John: Very well put, as always. This concept of relaxation is strongly emphasized in Aikido. In fact, in Kokikai Aikido, we speak of "relaxing progressively." We try to remind ourselves that relaxation is not a goal, it is a process. One technique my students and I employ to understand this concept is to "over-relax." 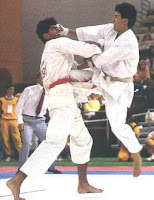 The idea is simple: the uke attacks (occasionally with less force than normal, for the purposes of the exercise), and the nage completes the technique while relaxing far more than they think they should. The result? Most students suddenly realize that their concept of being "too relaxed" is actually closer to correct movement than they think! Obviously, this is just an exercise to demonstrate a principle, and I do not know how it might work outside of Aikido, but I'd thought I'd share this nonetheless. If I could just figure out how to breathe properly I think I'd feel a lot better after my marathon karate nights. When I threw disk in track, my brain and muscles had to be relaxed to throw far. My coach compared relaxed muscles to rubber bands. I still have trouble staying relaxed like we're supposed to. When I do manage to do things correctly, I'm amazed by how much better my technique looks, and how much stronger it is. Very good post, thanks for reminding me how important this is. I bet this exercise would still work with your people if uke attacked with full power and speed. I'm sure you're seen this with the higher ranks anyway. Sure it would work in other styles. Your comment is a reminder that the concept of relaxing is probably addressed more in the internal schools than in the karate/kempo hard styles. Thanks for your input. One problem I used to have was intermittently holding my breath during techniques (usually self-defense/bunkai). It's funny, I was thinking of the shot put (metal-ball throwing sport) analogy myself. Even though the shot weighs 16 lbs. and requires a good deal of power to send it on its way, the launching phase is based on speed and flexibility. The same goes for the disk. Sometimes it's just a matter of being aware that we're not relaxing. One of the best antidotes for tension that I like is the simplest: just take a slow, deep breath. I still have trouble relaxing and not holding my breath--especially when I do a form. If I had a stressful day at work I usually show up at practice still tense and it shows. Correctly breathing is so hard. I always end up in a bit sweat, out of breath. I try to breathe the right way, but clearly, there's something I'm doing wrong. Sensei does the same kata almost effortlessly. -0- sweat coming out. But one day I will vanquish the tenseness, and create relaxation.. Don't ask me when..